﻿PHOTOGRILL: Why did you make this photo? PHOTOGRAPHER: This photograph was taken for a story about local fashion labels. The photo idea came with a brief from the fashion editor. Photograph a model wearing a dress at the small factory where it was made, in Fitzroy. It’s a story driven picture idea, which often means I need to hack into the brief in order to make an image. PHOTOGRILL: Was it a difficult photo to take? PHOTOGRAPHER: On the surface of it the idea was good, but when I saw the factory I wasn’t so sure. It was badly lit and small, and despite actually being fairly orderly it looked too messy and distracting for a two-dimensional photograph. 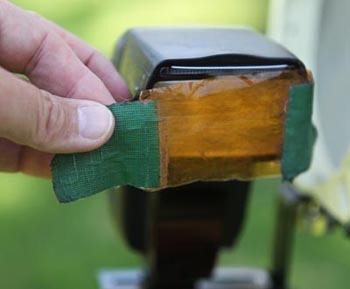 This is often where we still photographers come unstuck. We are presented with a scene, which may look fascinating to us as we wander amongst it. Yet in a photograph it may be a disaster zone. The reason is because we view real scenes differently to photos. At a photo location we walk around, taking in the many details and rebuilding a picture of the scene in our minds, complete with emphasis on the things we find most interesting. But when we view a photo of the same scene the emphasis has been removed and we are not free to wander around in a three dimensional location choosing what to look at. Everything is thrown in together, the meaning of things is much harder to appreciate, and we usually don’t bother trying. PHOTOGRILL: What did you do about that? PHOTOGRAPHER: What the photo needed was a way to de-clutter the scene. And to add emphasis to the most imortant aspects, while not actually losing the vision of the busy little factory. The story is essentially about the dress, so the model was elevated onto a workbench to help create the correct emphasis. She was then lit using a small soft-box flash with a warming gel. By using a soft-box the model wearing the dress is emphasised because the background is made about one f-stop darker. PHOTOGRILL: How else did you separate the model from the background? PHOTOGRAPHER: I used a warming gel on the soft-box, and compensated for it by setting the camera to factor in the warm tungsten light. The soft-box flash was carefully placed so that the light from it would only reach the dress then drop off in intensity. To do this you need to be able to place the light very close to the subject. That has the effect of making the entire background a cool blue colour. 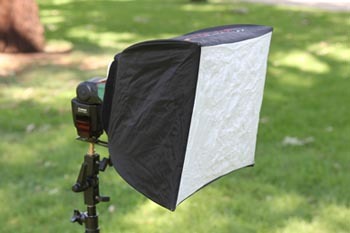 While the soft-box lit model, becomes warmer in hue. This effect of ‘cooling’ the background helps the viewer to make sense of the scene. What was a distracting multi-coloured mess has now become a tame, mono-toned, textured landscape. It is much easier on the eye. The warm hue of the model wearing the dress is emphasised against the busy factory. In this way way a photo can be built piece by piece. Firstly by choosing the elements that will go together, then by placing and lighting them in a way that emphasises the primary elements of the photo first. PHOTOGRILL: You used tone and colour to emphasise the dress? PHOTOGRAPHER: There are many photographic techniques that can be used to emphasis the subject and de-emphasise secondary elements in a photo, and viewers need this subtle information to guide them through an image. For example use of contrasting colours, saturating colours of the main subject, make the background darker in tone, use of more tonal contrast for the subject, blur the secondary elements, make the subject larger or higher in the frame, use a striking pose or expression, use of an object to frame the main subject, etc. I tend to use a combination of techniques together in one photo. That way the technique is somewhat hidden whereas the message is clear. Later I edited the photo using Photoshop CS3. It was simply fine tuning the same aspects of emphasis and de-emphasis. Making sure the statement the image is making is clear but not overstated. This entry was posted on Monday, March 21st, 2011 at 4:50 pm. It is filed under Fairfax Photographers, The Grill and tagged with Creative Photography, Lighting, People, Photographic Techniques. You can follow any responses to this entry through the RSS 2.0 feed. Great images Craig! dig the lighting! Love ur lighting this @photogrill #Photo from my portfolio. Model wears dress at factory where it was made. @photogrill Craig Sillitoe’s light pictures are legit!! !